Do you have to audition to be a member of COHC? No. COHC welcomes all homeschool children ages 5 through 18 who desire to learn basic vocal music skills and develop in choral music education. That said, students may sing individually or a small group for their director for voice placement but no preparation will be necessary. How big are the classes at each location? Music Experience classes have a class limit of 20 students per class. Principio, Illuminati and Bella Voce has class limits of 30 students per class. Should a class become full, a student will have the option of attending class at another location or be put on our waiting list for the next available opening at their desired location. Financial assistance is available as funds are donated. For more information, see our scholarships. How often will members perform? COHC schedules two combined concerts throughout the school year. 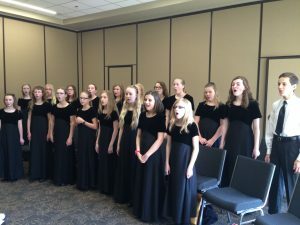 In addition the older choirs participate in a local tour as well as a national choir competition held locally each year. Community performances are occasionally scheduled for all ages as well. Where will the performances be held? Concert locations vary from year to year. For specific locations, refer to this year’s calendar. What do members have to wear to rehearsals and concerts? Members may wear casual attire to rehearsals unless specified otherwise. Concert attire includes a formal uniform that must be ordered by the student prior to each semester’s uniform check about midway through the semester. Is choir worth a high school credit? For students wishing to count participation in COHC as high school credit, our rehearsal and performance hours equal a ½ high school unit. To complete a full unit or credit within one school year, we recommend completing one of the high school music courses in our “Recommended Music Resources” shop or rehearsing COHC music 1 1/2 hours each week between choir rehearsals.